Is Premier antifouling compatible with my existing antifouling? Both our Premier One Can & Premier Cruising Grade Antifouls are self priming and fully compatible when applying over all other Major Brand copper based antifouls that vast majority of all antifouls today rely on copper oxide as the main active ingredient. The only Antifouls that we have any compatibility issues with are just a few of the hard racing type antifoulings that contain Teflon. Which as we all know is designed as a none stick, therefore we would recommend applying a coat of our Multi-Purpose Metallic Primer before applying our antifouling. Is Premier antifouling any good it’s much cheaper than the antifouling I bought last year? 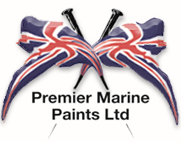 When purchasing Premier Antifouling from our web site we are unique in that your are purchasing direct from the manufacturer , we have therefore removed and are saving you the added distributor, wholesale and retail margins which is why our prices are typically cheaper than the equivalent grade brand leaders. In terms of Antifouling performance Copper Oxide since the banning of TBT in antifouling is now the main active ingredient that dictates how long and how well an antifouling will perform. In short all copper based antifouls are designed to allow the copper oxide to gradually leech and refresh at the surface of the paint and it’s the copper that acts as the main biocide that prevents fouling. So the higher the copper content in an antifouling the longer and better it will perform before the copper in the paint becomes depleted and the performance then breaks down resulting in fouling. Premier One Can is our performance antifouling and contains a very high copper oxide content which is equal to and in many cases a lot higher than most of the brand leaders. Our Premier One Can is rated for highest of fouling areas for full season coverage and will outperform many of the brand leaders. Our Cruising Grade Antifouling has a lower grade of copper content which is why we recommend it for low to mid fouling areas for full season coverage. However we have many regular customers that have been using our cruising grade for a number of years in high fouling areas with out any performance issues and with great success, these are generally customers that launch there boats typically in March and then bring there boats out of the water in September / October for the winter, because they are only in the water for 6 / 7 months of the year there is enough copper to last and perform during this period so why pay more for a copper content that you wont see any benefit from. However if you have experienced any problematic fouling in your area then again we would recommend using our Premier Performance 1 Can antifouling. How many coats of antifouling do I need to apply? To ensure that both our antifoulings give the maximum performance they are designed for and perform as they should do, its is important that the boat hull is prepared and the antifouling paint applied correctly. We recommend that you apply two coats of our antifouling and an extra coat around the water line. The most common reason for antifoul to under perform is if it is applied too thinly or a coat is skipped, therefore the active ingredient (copper oxide) will become depleted early and the performance of the antifoul will deteriorate too fast resulting in fouling. For full details on preparation and application of our antifoulings please refer to our technical data sheets. Ensure you purchase the right amount on antifouling for the size of your boat to give you enough for the recommended two coats, if unsure please refer to the how much antifouling paint table on our Antifouling Tips page. You will also find a coverage calculator on each product page. Does Antifouling Have a Shelf life/ Use by date? Yes we recommend that our antifouls are used within 2 years from the purchase date. All our stock direct from the factory is new and can be stored for up to 2 years before application. We would like to make you aware that all Copper Based Antifouling has a shelf life, there are a number of factors that dictate the use by date of an antifouling and it is always worth checking how old the antifouling is when purchasing to ensure that it performs as it should do. The main issue that occurs with all copper based antifoulings is that over a long period of time the copper oxide in the can starts to separate and then harden. Once this happens then no matter how much you stir the paint whether by hand or machine you find that there are pea sized lumps of copper contained in the paint that cannot be broken down, when you then go to apply the paint the copper is not being applied correctly and evenly within the paint, the result is the antifouling will not perform as it should, if at all. You may have experienced this problem if you have ever gone to use up an old can of antifouling left over from the previous season. We attend a lot of Boat Jumble events in a year as a good way of getting out there and meeting our customers, answering questions, giving them technical information and promoting our web site. We have been amazed at the number of stalls that have been selling out of date brand leading antifouling very often in rusty cans and we strongly recommend you avoid these, they may appear to be very cheap but they will not perform as they should do. Is copper based antifouling ok to use on my outdrives? No you must never use copper based antifouling on your outdrives or any under water metals, this includes our Premier Cruising Grade Antifouling and our Premier One Can. The problems is because antifoulings containing copper and copper is a hard metal this will result in electrolysis (Galvanic Corrosion) on the outdrive. Electrolysis (Galvanic Corrosion) originates from electrical currents in the water surrounding the boat. Electrical currents in the water are most commonly caused by boats shore power cables hanging in the water, lose wires hanging in the bilge and dock wiring with improper grounding. If you paint copper based antifouling on to an aluminum outdrive a electrical current will form between the two metal and electrolysis (Galvanic Corrosion) will start to occur when the weaker metal aluminum begins to lose molecules in the water, the electrolysis problem cause by copper antifouls will simply eat holes into the outdrive and eventually destroy the outdrive completely. We also recommend when antifouling your boat with copper based antifouling to leave a one inch boarder around the gimbal housing of the outdrive to avoid any copper antifouling from touching the aluminum drive and creating a current between the two metals. My antifouling since launching the boat has changed colour slightly why? This is a common with all copper based antifoulings, when the boat is launched and the antifouling paint immersed in the water it becomes activated, with the copper ingredient contained in the paint coming to the surface of the paint and starting its job as the active biocide preventing fouling, as a result the copper effects the overall appearance of the colour generally resulting in the colour becoming slightly lighter, the higher the quality grade of the antifouling in terms of the higher the copper content then the more noticeably this may be. If the appearance of the colour of the paint is absolutely critical around the water line then the only option is to use what is commonly called a boot top antifouling which is a hard scrubable none copper based antifoul that contains some booster biocide this is then painted around the first few inches of the water line, however in terms of performance compared with copper based antifouls then the performance is generally very poor and you will find that mid way through the season you will more than likely need to scrub off the boot top because of fouling. Since Antifouling my boat out of the water, strip marks have appeared on the paint why? If you antifoul you boat with any copper based antifouling and leave it out of the water for any period of time before relaunching, if we have wet weather as rain water runs down the boats hull and over the antifouling it will start to activate the copper in the paint, which will start to come to the surface of the paint. Then when boat hull dries off again this will leave behind marks were the copper has started to come to the surface. This is normal and nothing to worry about once you launch the boat and the antifouling in immersed in the water it will become full activated and the strip marks will disappear with the antifouling all the same colour. If you have any questions at all regarding Antifouling the please email your question to [email protected] and one of our paint chemists will be happy to be of assistance. How soon after antifouling should I launch? The launching of your boat should be done within 3-4 weeks of application of the antifoul, longer than this and the paint will harden reducing the ability of the paint to self erode and thus reducing the release of copper to the surface and hence reducing the antifouling property of the paint. Can Premier Antifouling paint be thinned? Premier antifouling may be thinned up to 10% with our type 3 antifoul thinners. This may be done if the antifoul is viscous due to lower temperatures and will aid the application of the antifoul.